Truett Cathy died this past week at the age of 93. He really understood and lived out what it means to live out a gospel centered life at work. He knew he was an imagebearer, and imitator of God in his work that took pride in what he did. He knew he owed his life to God and therefore served his neighbor well. Finally he saw business as relational and didn’t shy away from the message of the gospel …. even when it was hard. Here is a great article from the opinion section of today’s Wall Street Journal that encapsulates his life and legacy well. When Chick-fil-A founder Truett Cathy died on Monday at age 93, America lost a true giant of a business leader. I was honored to call him a longtime business partner, a dear friend and a teacher.Truett lived the classic Horatio Alger tale, rising from humble roots to create a sensationally successful business. His business experience began at age 8 in Atlanta, when he started buying six-packs of Coca Cola for a quarter and selling each bottle for a nickel.After serving in World War II, Truett opened his first restaurant—a diner in Hapeville, near Atlanta—in 1946, with his brother Ben. In 1961 Truett invented the boneless chicken-breast sandwich that would eventually become a nationwide phenomenon.Chick-fil-A is now America’s largest fast-food chicken restaurant, with $5.5 billion in annual sales—and a remarkable 47 years of consecutive annual sales increases. How did Truett do it? As someone lucky enough to know him, I saw six characteristics that defined the way he approached business, people and the communities he served. First, Truett believed in himself, despite having only a high-school education. An irrepressible optimist, he was convinced that he could make something of himself. And he did. Second, Truett worked hard. A child of the Great Depression, he saw work as a privilege and made a point of enjoying it. In fact, he didn’t hand over the reins to his son Dan entirely until last year. Even on Sundays, when he closed his restaurants to honor God and give his employees a day of rest, Truett stayed busy, teaching Sunday school at First Baptist Church in Jonesboro, Ga., for more than 50 years. Third, Truett embodied the culture of service that he wanted to build. He was devoted to serving others, from his customers and employees to young people and others in his community. He understood, like few others, what it meant to be a steward of a great brand. If a brand is a promise, then a great brand is a promise kept. Truett kept his promises. He showed his respect for his customers by insisting on high quality: the quality of the food; the quality of the restaurant experience; the quality of each customer interaction. Fourth, Truett never stopped innovating, beginning with the creation of the Chick-fil-A sandwich itself. If you’ve never had one, you might ask what’s so special about a seasoned boneless chicken breast on a buttered bun, garnished with nothing but a pair of pickle chips. It’s still one of a kind, but 53 years ago it was a revelation. Truett’s very business model was an innovation. Unlike traditional franchises at the time, Chick-fil-A restaurant operators became partners in the business, and that ownership culture became a strong competitive advantage. Many of the company’s corporate employees began their careers working in a Chick-fil-A restaurant. Another innovation was Truett’s decision in 1967 to locate the first Chick-fil-A stores inside shopping malls, long before food courts were common. This allowed him to start with a specialized product in a unique location with little competition and lower real-estate costs. The first stand-alone store, in Atlanta, didn’t open until 1986. Fifth, Truett was generous. In 1984 he founded the WinShape Foundation, named for its mission to “shape winners.” WinShape, among other priorities, provides foster homes for children. About 150 children and young people now live in more than a dozen WinShape homes in three states. College students benefited from Truett’s generosity, too. 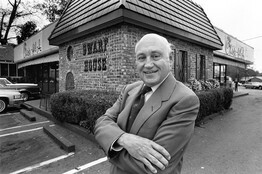 He launched a scholarship program for restaurant team members in 1973, an initiative that has awarded more than $30 million in $1,000 scholarships. Next year Truett Cathy will be honored with the likes of Walmart founder Sam Walton when the Smithsonian’s National Museum of American History opens an exhibit devoted to entrepreneurship. It will be a fitting and timely tribute to a true American visionary who embodied the entrepreneurial spirit. Mr. Kent is chairman and chief executive officer of the Coca-Cola Co.